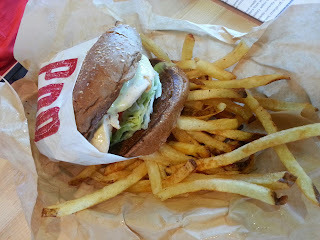 PDQ opened recently, so I went with my parents to check it out. For starters, the place was packed! The line was wrapped around the restaurant (inside)! Even though they were extremely busy, the line moved really fast. I got the 4 tender basket with fries and my dad got the 3 tender basket. When they came out, we were each missing a tender. They had only been open for a few weeks when we went, so I had to cut them a little bit of slack. 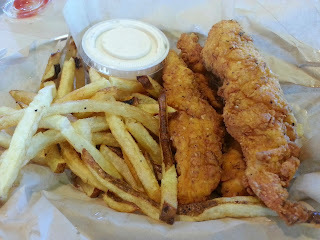 I flagged down an employee walking by and they quickly fixed the mistake :) I really liked the tenders. The breading was crispy and the chicken was juicy. I wasn't in love with the fries. They are homemade and were a little soggy. That is usually the case with fries like this, but still, I was a bit disappointed with them. Verdict: I liked it OK. I don't know that I would make the trip out there, but I would go if I was in the area. The prices are reasonable and the tenders are good. I just think they need to work on the fries and the communication to get the orders right.